PA Chairman Mahmoud Abbas says that the freeing of terrorists serving time in Israeli prisons is a "priority" for his leadership. Palestinian Authority Chairman Mahmoud Abbas said on Wednesday that the freeing of terrorists serving time in Israeli prisons was a "priority" for his leadership. 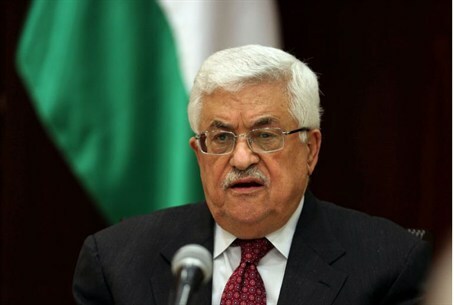 "The Palestinian leadership gives priority to the prisoners issue and ending their suffering," Abbas said in a speech to a meeting of his Fatah party in Ramallah, according to AFP. "We cannot be silent about their staying behind bars... (we) have demanded the freeing of all prisoners, especially those arrested before the Oslo accords, and sick, child and women prisoners," he said. "But the Israeli government, in its arrogance, doesn't care" about the detainees, he claimed. The speech came after thousands of PA Arabs rioted over the death the death of an elderly terrorist who was serving time in an Israeli jail. The terrorist, 64-year-old Maissara Abu Hamdiyeh, died of cancer on Tuesday in the Soroka Hospital in Be’er Sheva. The PA has blamed Israel for Hamdiyeh’s death, which led to a wave of rioting. Abbas said on Wednesday that in light of "the achievements in the UN" -- a reference to the upgraded status he received at the UN late last year -- the leadership would "go to the ends of the earth to protect our prisoners." He also slammed Israeli construction in Judea, Samaria and eastern Jerusalem and, referring to U.S. President Barack Obama’s recent visit to the region, said, "Obama's visit to Palestine was positive. We presented our stance on the peace process... and explained the dangers to the two-state solution posed by continued settlement building." Abbas’s comments came as the State Department announced Wednesday that U.S. Secretary of State John Kerry would return to Jerusalem and the PA early next week to build on talks and try to restart a stalled peace process. Abbas has continuously imposed preconditions on peace talks and has demanded that Israel freeze Jewish construction in Judea, Samaria, and eastern Jerusalem. When Israel froze construction for a ten-month period in 2010, however, he refused to come to the table.